Note to editors: A photo is associated with this press release. Bombardier is proud to announce that its class–defining business jet, which is surpassing commitments during flight testing, will now be known as the Global 7500 aircraft, in concert with the recent unveiling of the new Global 5500 and Global 6500 aircraft. 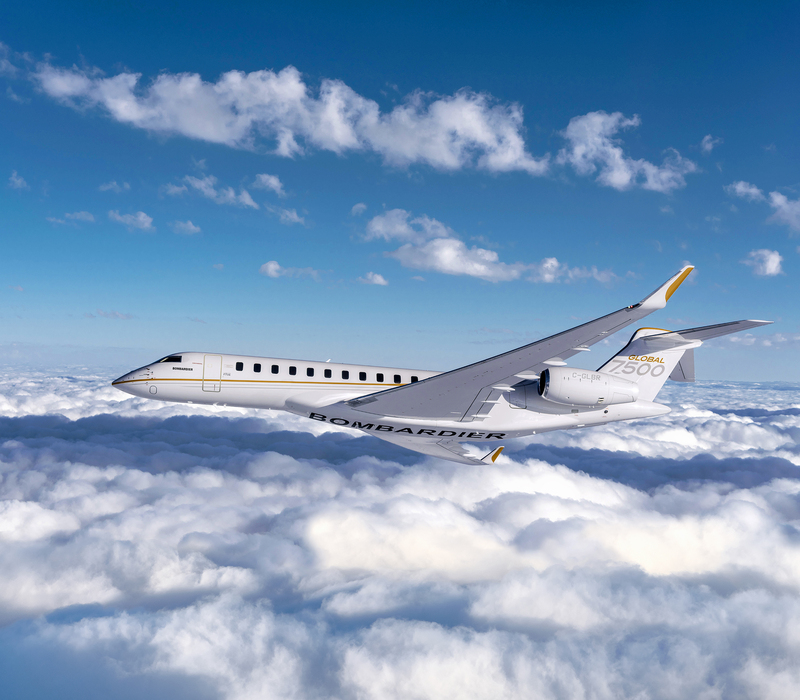 "Our Global family of aircraft is entering a new era, with the Global 7500 aircraft as its flagship," said David Coleal, President, Bombardier Business Aircraft. "The market's largest and longest range business jet will soon be joined by our newest additions, the Global 5500 and Global 6500 aircraft, reinforcing the fact that our Global family is, by far, the best large–cabin aircraft family in business aviation." The Global 7500 aircraft is on track to enter service during the second half of 2018. All five of its test vehicles are in the flight test program, with more than 2,000 hours of flight testing accomplished, demonstrating significant maturity, reliability and a smooth ride. Bombardier recently revealed that the Global 7500 aircraft boasts an unmatched range of 7,700 nautical miles, a full 300 nautical miles further than initial commitments. It is the only business aircraft that can connect New York to Hong Kong, and Singapore to San Francisco, nonstop. * Today, Bombardier is proud to announce further performance enhancements, which, like the range extension, will come at no additional cost to customers. Thanks to its sophisticated wing design, rigorously tested during the flight validation program, the Global 7500 aircraft has also exceeded takeoff and landing performance commitments, leading to a new published takeoff distance of 5,800 feet at full fuel in standard operating conditions. This improved takeoff performance distance is almost 500 feet shorter than the closest, and much smaller, competitor aircraft and enables the Global 7500 aircraft to access airports with shorter runways. The landing performance of the Global 7500 aircraft has also been improved — now rivalling the stopping distance of aircraft in the Light jet category — and with the low–speed aerodynamics of its wing, the aircraft can land effortlessly in steep approach air fields, such as London City. Thanks to the superior wing design on the Global 7500 aircraft, customers will now enjoy class–leading takeoff and landing performance, a maximum cruise speed of M 0.925 and a uniquely smooth ride. The Global 7500 program's innovative and industry–leading ground testing, combined with the extensive use of proven engineering tools and simulation, allowed for a very mature aircraft at the start of flight testing and an efficient flight validation program. Full–scale structural testing of the aircraft was successfully concluded on the Complete Airframe Static Test (CAST). Full–scale fatigue testing is also executing per plan, and Bombardier has successfully completed one lifetime of simulated flights, which exceeds the requirements at time of certification. "The rigour and innovation behind our Global 7500 aircraft design and test program have allowed us to deliver enhanced performance without compromise," said Stephen McCullough, Bombardier's Vice President of Integrated Product Development for the Global 7500 and Global 8000 Program. "Thanks to our innovative designs, coupled with extensive and unprecedented use of integrated ground test rigs and simulators, our flight test vehicles have shown maturity and performance that surpass our initial commitments." Upon entry into service, the Global 7500 aircraft will offer spaciousness that is unique among business jets, with a full–size kitchen and four true living spaces. The Global 7500 aircraft also debuts Bombardier's patented Nuage seat, which was meticulously designed for maximum comfort and will be exclusive to the new Global family of aircraft. Bombardier's Global 7500 aircraft is the recipient of a 2018 Red Dot Award for Product Design. Bombardier, Global, Global 5500, Global 6500, Global 7500, Global 8000 and Nuage are registered or unregistered trademarks of Bombardier Inc. or its subsidiaries.